Birmingham is home to one of Europe's premier venues for contemporary art, showing exciting, innovative and challenging artists. Since the early 60's Ikon Gallery has championed the work of living artists, providing a showcase for their talent and introducing their work to new audiences. 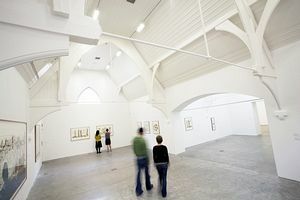 Ikon Gallery is an educational charity providing talks, tours and workshops. The Gallery occupies the former Oozells school, a fine example of the city's Victorian architecture. Ikon saved the building from dereliction and their architects Levitt Bernstein Associates converted it into an exhibition space of international standards. Ikon is committed to showing a wide range of new and established artists who are working in exciting and diverse ways, producing video, paintings, sculpture, computer work and photography. The Gallery regularly commissions new art, ensuring that artists are able to develop their work when they exhibit at Ikon. The exhibitions have a strong international flavour, as well as showcasing British art; they also tour extensively taking the names of Ikon and Birmingham across Europe, North America and Central America. Alongside its exhibitions in the gallery, Ikon runs an annual programme of small scale touring shows taking contemporary art into schools, community centres, libraries and theatres across the region. By Car: From Five Ways down Broad Street, turn left at traffic lights onto Sheepcote Street and follow signs for the Brindleyplace car park. Parking spaces for orange badge holders are on Oozells Street opposite Ronnie Scott's Club. 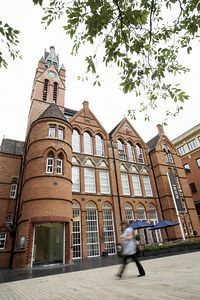 By Train: Ikon Gallery is 15 minutes walk from New Street, Moor Street and Snow Hill stations, through Paradise Forum and the International Convention Centre. By Bus: Broad street is on a main bus route into the city. Alight at the Ministry of Sound Bar/Ronnie Scott's Club in Broad Street.